/\ Quite agree. Saini and Bumrah can be lethal together. Both are also hungry for success. Top it up with Siraj, Khaleeland perhaps Avesh, the attack will look deadly. Lots of balls in the 145 k to 148 k range. Both his short balls and fuller balls have looked quick today. Finishes with 1 for 17 from his 4 overs. Good to see Saini back in favour of the iCF pace brigade. He was almost disowned, like Khaleel, a few weeks back. Never disowned Khaleel or Saini. He is young, and has time to improve, but right now he is just inept. Saini for a brief period last year was not meeting our high expectations.. most of us here would prefer him to be our third pacer in tests i guess. Lots of balls in the 146 k to 148 k range. Both his short ball and fuller ball have looked quick today. Wth !!!!!! 151kph ?? You Kidding me???? Bro you can watch the match replay on Hotstar. Pace like fiyah. Average pace of 145k in his first 2 overs with good accuracy. Though he slowed down a bit in is 3rd and 4th over with pace around 140k. People dont understand that most of the bowlers have the potential to be really good. Much depends upon how they are handled, what kind of instructions the management needs to give them or are given, what are the expectations and whats the briefing given. For all we know, the team management could have instructed Khaleel to bowl slower. I believe that most of these youngsters are good. We only need to handle them with care. Theres no way I would give up on them, except for people like Sid Kaul and the likes. Yes! 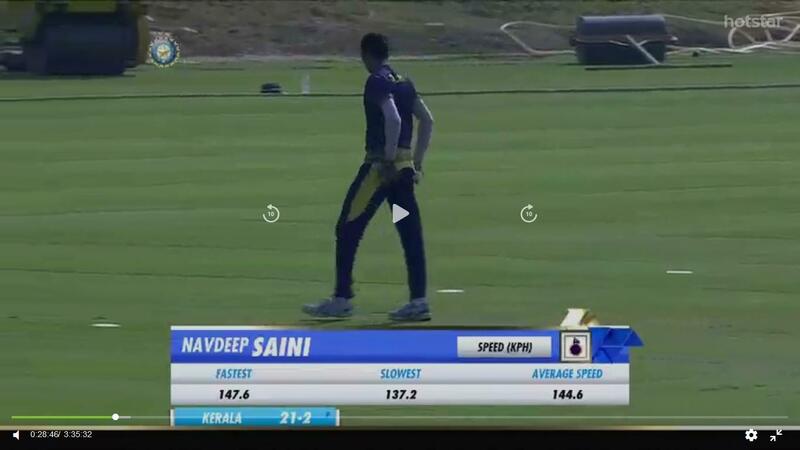 Watched it on hotstar and believe me he seriously looked that quick. Ball was thudding into the gloves. Good thing about him is he comes quicker of pitch like bumrah bowls lots of heavy ball. Take a sample of past 2 pages. 80 % are on how well he has done. Lol how did he loose favor ? And cant rermeber were. But I posted somewhere here after watching him in ranji game maybe 2 months ago. I was shocked how quick and well bolwed, as thought he was like 136 to 141 bowler but that day in 4 day ranji game was clokcing high 140s I think. ANother day, another set of 150+ kmph deliveries by Saini. Does anyone in the Indian Team managemnt even know about him? We will have Kaul bowling laddu balls later today while a genuine pacers toils in domestics. Saini, very impressed with in recnt ranji, yes figures dont look good but was clicking 140 plus. Been injured? If come back game I saw potential. oh....he has to play the world cup then. 145K Average Speed....even varun and Umesh did not achieve that at its peak. This is some serious form. I am sure he wont be in this kind of form for long. Selectors have to keep that into mind and get him to play against australia in Odi's. this is seriously exciting situation which should be urgently noticed. Just watched his bowling today. Express pace. 3rd ball that he bowled was 149k. Clocked 151k again today. The selectors should choose Saini as an extra member in the ODI squad against Australia. A pacer bowling 150 k with accuracy can be an asset in England. Bro hope our selectors are watching. But these idiots will select someone like Kaul or Shardul. Phasshhht bawling Paaawerhouuse still playing trundlers!!! Dhoni's fingers will hurt.. Bhuvi until WC..
Saini after Dhoni is gone..
Selectors should be selecting him right away, but knowing selectors, they are somewhere sniffing coke. Why are these idiots still selecting Kaul???! These selectors and team management are so obtuse. It’s never too late to try new bowlers. Except Bumrah and Shami no one has looked threatening. So choose someone who looks promising and brings something different to the side. I’d definitely pick Saini in this case. These selectors and team management are so obtuse. It’s never too late to try new bowlers. Except Bumrah and Shami no one has looked threaQualittening. So choose someone who looks promising and brings something different to the side. I’d definitely pick Saini in this case. The biggest bane in Indian cricket now. Aaj khush to bahut hoge tum... Aayein? Kitna bhi fast bowl pheck le , khelengey to kaul,thakur aur chahr hi . this is real pace. He needs to be on the plane to England. we should tag selectors with this info. he is young will probably add a bit of pace in next year or so and stay there for a couple of seasons.